Preheat oven to 400°F. Cut chicken into 40 (1-inch) pieces. Place flour, salt, and pepper in large resealable food storage bag. Combine cracker crumbs and oregano in shallow bowl. Whisk together egg white and water in small bowl. Place 6 to 8 chicken pieces in bag with flour mixture; seal bag. Shake until chicken is well coated. Remove chicken from bag; shake off excess flour. Coat all sides of chicken pieces with egg white mixture. Roll in crumb mixture. Place in shallow baking pan. Repeat with remaining chicken pieces. Bake 10 to 13 minutes or until golden brown. Meanwhile, combine barbecue sauce and jam in small saucepan; cook and stir over low heat until heated through. 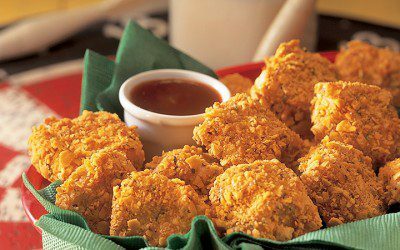 Serve chicken nuggets with dipping sauce. Note: To freeze chicken nuggets, cool 5 minutes on baking sheet. Wrap chicken in plastic wrap, making packages of 5 nuggets each. Place packages in freezer container or plastic freezer bag. Freeze. Note: To reheat nuggets, preheat oven to 325°F. Bake nuggets on ungreased baking sheet 13 to 15 minutes or until heated through or microwave 4 to 5 nuggets on microwavable plate at DEFROST (30%) 2 1/2 to 3 1/2 minutes or until heated through, turning once. Note: For each serving, stir together about 1 1/2 teaspoons barbecue sauce and 1/2 teaspoon jam in small microwavable dish. Microwave on HIGH 10 to 15 seconds or until hot. Serving size: 5 nuggets with about 2 teaspoons sauce. Exchanges per serving: 1 Bread/Starch, 1 1/2 Meat.